Running on a track can be convenient as it helps you avoid traffic hassles, but not all areas have tracks open to everyone. High school and college facilities are usually open to the public as long as you use the outer lanes, according to Amateur Endurance. But not all lanes are created equal, so knowing how to calculate the distance around a track by lane is helpful. 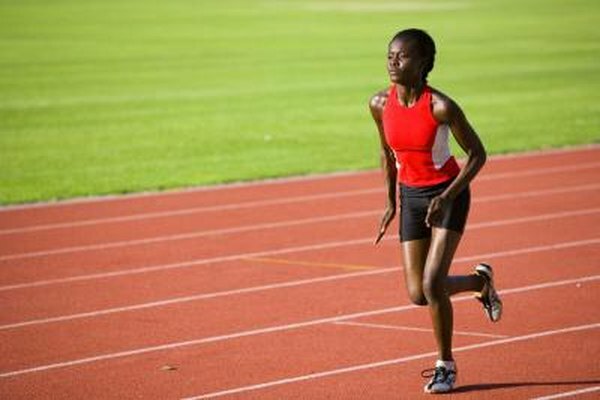 For example, if you run in the outside lane of a standard 400-meter track, you add over 53 meters to the distance of each lap, or about 13 percent. Find out the length of the running track. Most outdoor tracks are 400 meters around the innermost lane. However, some tracks are different lengths. Indoor tracks may be one-tenth of a mile or even less. If you aren't sure, ask the facility staff for information about the length of the track. Measure the width of the lanes. Most tracks use a standard width of 1.22 meters, or approximately 4 feet. Even in the center lane you may run slightly farther than the stated track length, according to the International Association of Athletics Federations, because it is usually measured from the innermost line. Choose your lane, get the lane number and subtract one; next, multiply that figure by the lane width. For example, if you are going to run in lane six, multiply five by the lane width. For a lane that is 1.22 meters wide, calculate 6 minus 1 -- which is 5 -- and then multiply 5 by 1.22, which is equal to 6.10 meters. This is the distance from your lane to the innermost lane. Multiply the distance from the innermost lane by "2pi," or the number two and the "pi" symbol. If your calculator doesn’t have a "pi" function, multiply two by 3.14. For example, if the distance from the innermost lane to lane six is 6.1 meters, multiply this distance by two and multiply again by 3.14. In this example, you get a distance of 38.31 meters. This is the extra distance you run in one lap around the track. Add the extra distance to the track length and multiply by the number of laps you want to run. This is the true distance you will cover.